"This was the main road to Harrisonville. Fagan's Confederate Division was posted here at noon on October 23, 1864. At daylight that day General Price's huge wagon train moved south on this road. After his defeat at Byram's Ford General Marmaduke retreated south following Price's column. General Fagan was reinforced by Jackman's Brigade. They faced east. Sanborn of Pleasonton's Division attacked them but was driven back, but he and Benteen then drove them to the south and west." Directions to Stop #15: Tour Stop 15 is located at the intersection of Meyer and Wabash. Turn north onto Holmes Road and head back to Gregory Boulevard. Turn right (east) onto Gregory. After about 0.9 miles, turn left (north) onto Paseo Boulevard. After about 0.6 miles, turn right (east) onto Meyer Boulevard. The marker is about one quarter of a mile ahead in the southeast corner of the intersection of Meyer and Wabash. 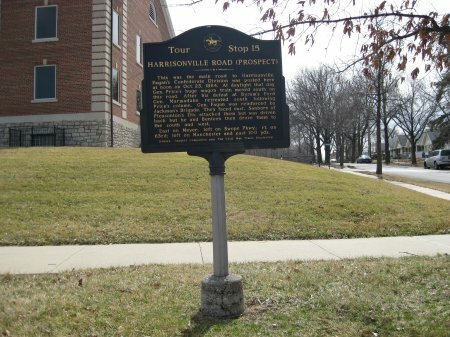 This tour stop is located in Kansas City, Missouri 64132. Description: On the morning of Sunday, October 23, 1864, Price had sent his column of 600 wagons and 3,000 head of cattle south from Independence, Missouri. Price left Brigadier General William L. Cabell's Brigade to guard the wagon train along with several thousand unarmed recruits that the Confederates had picked up along the way. The wagon train slowly went down Harrisonville Road on its way towards Little Santa Fe (Tour Stop 22). On the way to Tour Stop 16, you might want to stop at the Battle of Westport Visitor's Center in Swope Park. There are poster displays provide an overview of Price's Raid into Missouri. Directions: Continue heading east on Meyer Boulevard for about 0.75 miles. After crossing Swope Parkway, take the first right (south) turn. The visitor's center will be on your left.